Elaine Lonnemann , PT, DPT, OCS, MTC, FAAOMPT, a contributing faculty member, was elected president of the American Academy of Orthopaedic Manual Physical Therapists (AAOMPT) with her term beginning October 21st. Dr. Lonnemann has been a member of the university’s Institute of Physical Therapy since 1993 after completing a residency with the institute. She has taught online in the Transitional Doctor of Physical Therapy program since 2002, and she teaches the Continuing Professional Education seminar Functional Analysis & Management of Lumbo-Pelvic-Hip Complex. The seminar, which provides continuing education units for physical therapists, will be offered in 2018 in Boston and Baltimore. She has been an AAOMPT member since 1991, served two terms as secretary, and has served on several committees, including Nominating, Conference & Education, IFOMPT Educational Standards, and International Monitoring. In 2016, she received the AAOMPT John McMillan Mennell Service Award. 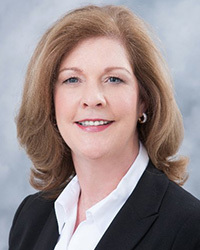 She is also an associate professor at Bellarmine University and has worked as a physical therapist at Northside Hospital and Sullivan Center in East Tennessee, Flagler Hospital, University of Louisville Hospital, and Roane Physical Therapy in Rockwood, Tennessee. She was a co-owner of physical therapy clinic in Indiana. Dr. Lonnemann earned a BS in Physical Therapy from the University of Louisville, and a master’s and doctorate in Physical Therapy from the University of St. Augustine for Health Sciences.